Fighting between gangs in the Brazilian city of Rio de Janeiro will lead to a "bloodbath" unless the authorities act, Amnesty International has warned. Turf wars between drug gangs from the city's slums could result in the deaths of many innocent people, the London-based human rights group said. 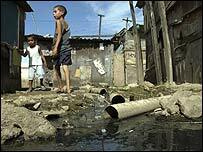 Hundreds have been forced from their homes since one gang moved into the Vigario Geral area, Amnesty said. Correspondents say Rio is one of the most violent cities in the world. Troops have been called in to maintain order in the Pakistani city of Multan after a car bomb killed at least 40 people at a meeting of Sunni Muslims. The attack took place at the end of an all-night vigil to mark the first anniversary of the killing of militant Sunni leader Azam Tariq. Police said a car exploded as thousands of mourners were leaving the gathering. 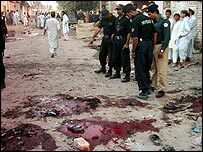 Last week, 31 people died in a bomb attack on a mosque used by Pakistan's minority Shia community. Sectarian attacks on the Shias have claimed more than 100 lives in the past few months. More than 50,000 people have been killed in communal clashes in one Nigerian state in less than three years, a new government study says. 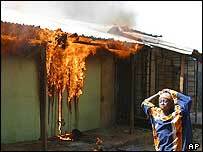 The violence has mostly pitted Christian farmers against Muslim animal herders in the central Plateau state. This figure is far higher than previous estimates of the number killed. It had been estimated that some 10,000 people had been killed in clashes between rival ethnic and religious groups across Nigeria since 1999. Three explosions at Egyptian resorts near the border with Israel have reportedly killed at least 30 people. The main blast happened at the Hilton hotel in town of Taba on the Sinai peninsula, just across the border from the Israeli Red Sea resort of Eilat. The cause is unclear, but Israeli security sources say they believe it was a car bomb attack. Shortly afterwards two smaller explosions were reported in nearby towns of Ras al-Shitan and Nuweiba. There is no word yet on casualties there. At least 100 people were wounded in the Taba blast - an Egyptian government spokesman put the figure at more than 160 hurt. According to Israeli media, 10 floors of the Hilton Hotel collapsed, trapping many people. 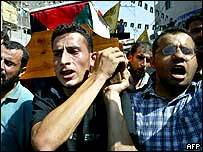 The United Nations has warned in a special report of an impending humanitarian crisis in the Gaza Strip. It says as many as 72% of Palestinians will be living in poverty by the end of 2006, and that Israeli restrictions are hampering emergency aid deliveries. Since 28 September, 82 Palestinians and five Israelis have been killed in Gaza, including 26 children, the report says. Compiled by 12 UN agencies, the report calls on Israel to allow the agencies free access throughout the strip. "Grieve not because I go away, for it is best that I should go away. The mysteries of the soul, of life, of death, of immortality, the oneness of man with every other man, and with his God. Then will the world be led to truth, and man will be truth.